If waiting two more weeks for Jazz & Rib Fest is too much to bear at this point, keep in mind that there is another great pairing of outdoor live jazz and delicious ribs this weekend just a short drive away. The 2016 installment of the annual Newark Jazz & Ribs Festival takes place at Canal Market District, 25 East Walnut Street in Newark, on Saturday, July 9th, from noon to 8pm. Along with the best ribs in Licking County, the local jazz lineup includes E-Flat (noon), Slapdash Quartet (2pm), Full Count (4pm), and the Heisey Wind Ensemble Big Band (6pm). Get warmed up for jazz and rib season! Friday, July 8th (6 – 8pm): Lisa Bella Donna and Mike Shiflet instore performance at Lost Weekend Records, Clintonville. Kyle Siegrist’s veteran record store will host an instore show celebrating the cassette/digital release of two new albums on Keith Hanlon’s Scioto Records. Prolific multi-instrumentalist Bella Donna will be performing a solo synthesizer set to give you a taste of Skylines, her second new album of recent months. The album sees her exploring her own personal, vibrant, and diverse brand of jazz fusion through the usage of an assortment of instruments, mostly of the keyed variety. Click here for samples and digital purchases and click here to order the cassette. Shiflet’s set will shed light into his Abstracting Grace, a new collection from the celebrated experimental noise artist. Stay tuned for reviews of Bella Donna’s albums, who tells me she has another one on the way! Saturday, July 9th (Noon – 1:30pm): PBJ & Jazz featuring the Jailynn Lake-Noel Quartet at The Topiary Park (Downtown). The second show of Jazz Arts Group’s Summer 2016 season of the PBJ & Jazz series for kids and their families brings a young group to the forefront. 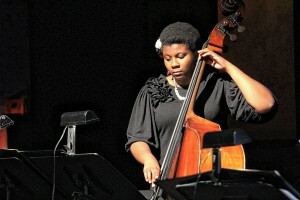 Award-winning Columbus Youth Jazz Orchestra bassist Lake-Noel of Gahanna will lead her own quartet to entertain and engage the young audience. This concert will be one of Lake-Noel’s final appearances in Columbus before she leaves to study Music Therapy and Jazz Performance at the University of Louisville in the fall, so grab the kids and enjoy a performance by an up-and-coming local talent. Sunday, July 10th (9pm – 1am): Zakk Jones’ Screeching Owl, Ryan Folger Octet, and WJD Trio at Cafe Bourbon Street (North Campus). In a makeup of a show previously planned for the June Screeching Owl tour, a cavalcade of talented young musicians, mostly Capital alums, will form three different bands for a night of excellent modern jazz. Ryan Folger Octet is: Alex Burgoyne on alto sax, Justin Dickson on tenor/soprano sax, Katherine Luikart on french horn, Aroh Pandit on trumpet, Danny Bauer on keys, Zakk Jones on guitar, David Wolbert on bass, and Folger on drums. As Folger leaves for the graduate program at the University of North Texas in August, this is currently the last scheduled appearance by the Octet. Folger tells me the band will be playing one set of his originals. I heard rave reviews for the Octet’s recent performance at Comfest, so seize the opportunity to see this group while you can!